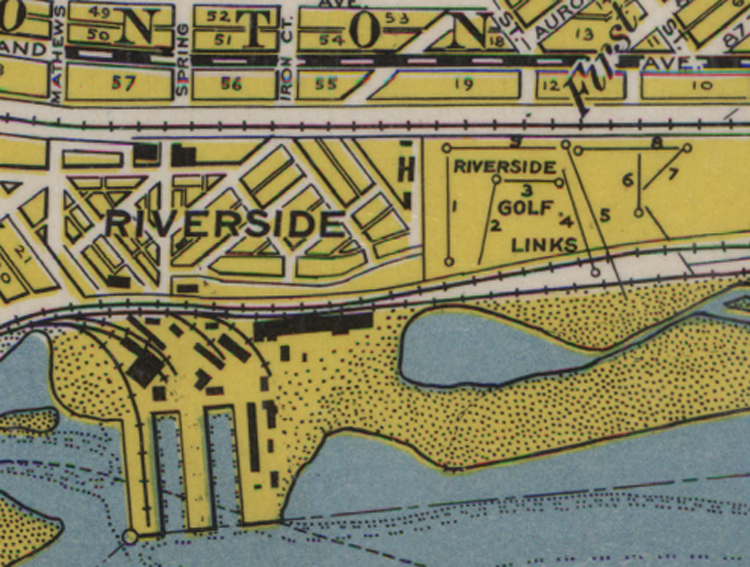 The location and layout of the Riverside Golf Club is shown here in this detail from the 1935 Welbanks map of Duluth. (Map: Duluth Public Library). The Riverside Golf Club opened in July, 1919, on a course laid out northeast of 85th Avenue West and south of Grand Avenue. It is unclear if this was a private endeavor or the work of the McDougall-Duluth Shipyards, which built the community of Riverside in 1918 to house its workers. The first mention of the course was in the April 24, 1919, edition of the Duluth News Tribune, which reported that “Work on the new golf course being laid out at Riverside by the Riverside Golf Club is being rapidly pushed to completion.” The article went on to say that the club already had 30 members, including officers John Wright, L. G. Bradley, and William Campbell. Clyde Heimbach of Heimbach Lumber was also involved, suggesting that the course was not directly affiliated with the shipyards. The club grounds, the newspaper reported, would also include tennis courts. Three days later the paper reported that the Club now had 75 members. Future plans included a club house and an expansion to 18 holes. The club promised to spend $25,000 to make “this club one of the leading clubs in the state,” further suggesting it was unrelated to the shipyard. 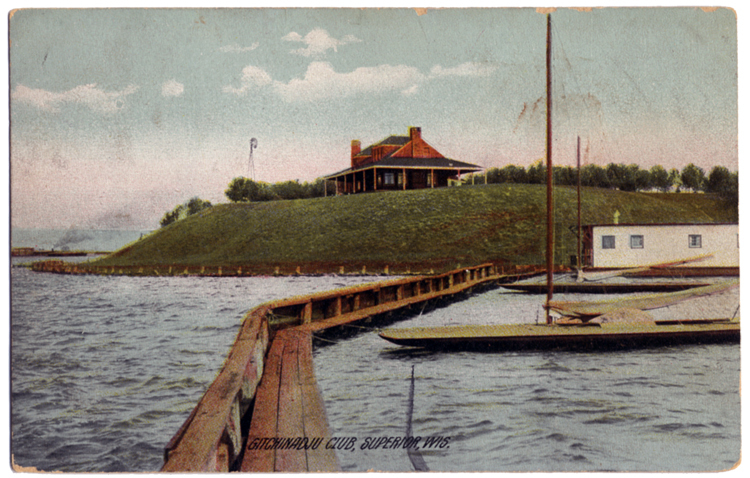 The September, 1919 Riverside Review, the shipyards’ newsletter, stated that, “fine grounds have been laid out and a club organized,” but did not state if the course was built by McDougall or his business partner, Julius Barnes. The course officially opened on Sunday, July 20, 1919. Three years later the Duluth News Tribune reported that its membership was not restricted to residents of West Duluth but was made up of “men from all parts of Duluth.” The course operated throughout the shipyard’s dormant years, but like the shipyards, didn’t last beyond World War II. While we could not find an exact date for its closing, the course was last listed in Duluth directories in 1945. Ted Dallos’ question about finding golf balls in the woods just west of Lakewood Township revealed another course. From 1932 to 1936 Duluth city directories include a listing for Lakewood Golf Club, indicating it likely opened in 1931. Joseph E. Vercelline was the club’s president and Edgar T. Chubbock managed the course. The image shown below of a map of Duluth from the 1930s indicates an 18-hole golf course, but the layout shown on the map is likely speculative. An aerial photograph found on the Minnesota Department of Natural Resources website shows a nine-hole course on the west side of Lakewood Road, a quarter mile north of Highway 61. The photo also indicates what could have been a club house, which is believed to have been moved and converted to a private residence when Highway 61 from Duluth to Two Harbors was expanded to a four lane expressway in the 1960s. It must have been a tall order to start a fourth private golf club in Duluth, which already had Northland Country Club (1899), Ridgeview Country Club (1920), and Riverside Golf Club (1919). The Lakewood course also had competition from two municipal courses; Enger Park opened in 1927 and Lester Park—not far from Lakewood Township—was officially dedicated in 1933. Considering this, along with the fact that the Lakewood course was created during the Great Depression, it’s little wonder the club didn’t survive for long. A golf club was organized [in Duluth] in 1900, having a nine-hole course located west of the Mesaba Railroad, between Superior and West Third streets. President, F.J. Lauremann; Vice-President, Thomas F. Sheridan; Secretary, William J. Barnes; Treasurer, Charles H. Southworth. This would have placed the course just about precisely where Wade Stadium and its adjoining softball fields now stand. Athletic Park was built on the site of today’s softball fields in 1903, which would have put an end to the golf course. The course was never mentioned in Duluth newspapers. Superior was home to another course that essentially served as Superior’s answer to Duluth’s Northland Country Club. Opened in 1900—a year after Northland opened—the Gitchinadji Town and Country Club sat on 40 acres on a point of land north of Billings Park along the St. Louis River near the end of 21st Street. (Like Billings Park, the course stood on property donated by the estate of Frederick Billings.) When first opened it boasted a $3,000 clubhouse designed by architect Arthur Thomas. Its founding officers included Ogden Hammond, son of Superior developer John Hammond and namesake of Superior’s Ogden Street. By 1930 it was no longer operated as a private club and became the property of the Gitchinadji Realty Company, though club members continued to operate the golf course. In 1935 it was sold to George Bacich, who split his residency between Superior and Minneapolis. In 1946 Bacich sold the property to Duluthians Margaret Amatuzio and Joseph Priley. Priley, a musician and son of Italian immigrants, was a civic leader in Duluth and is the namesake of the Duluth Civic Center’s Priley Fountain. In April 1952 manager Elmer Quist announced the Gitchinadji had suspended operation, but it was back in business by 1955 under the management of John and Ruth Mattheson. On September 7 of that year, Duluthian Carl Forsberg moved two organs worth $9,500 into the club’s ballroom in anticipation of his upcoming headlining performance, but he never got a chance to play. In the early morning hours of September 8, the building was destroyed by fire. The property has since been redeveloped as a residential neighborhood.